...and you can't find a hook or shelf ANYWHERE! Do you struggle to hold it while you go to the bathroom? Do you risk setting it on the floor and having a gazillion germs and nastiness on it afterwards? Do you get up and skip the bathroom altogether? Well, now you have another, much better alternative and it is called the Bagnet! It is a super simple, super versatile and super amazing purse accessory that you are going to thank many, many times in the future! Bagnet™ is a magnetic leather accessory that clips to your purse and magnetically hangs your purse in many different situations. Not only does it work in restroom stalls but also on barstools, chairs, tables, at concerts and sporting events, in arcades and casinos . . . the list goes on and on. Clip your Bagnet™ to your purse strap or hardware - that's its new home! Leave your Bagnet™ there as an accessory. It contains strong magnets and when you encounter a restroom stall without a purse hook, your Bagnet™ is at the ready to magnetically hang your purse from the stall wall. 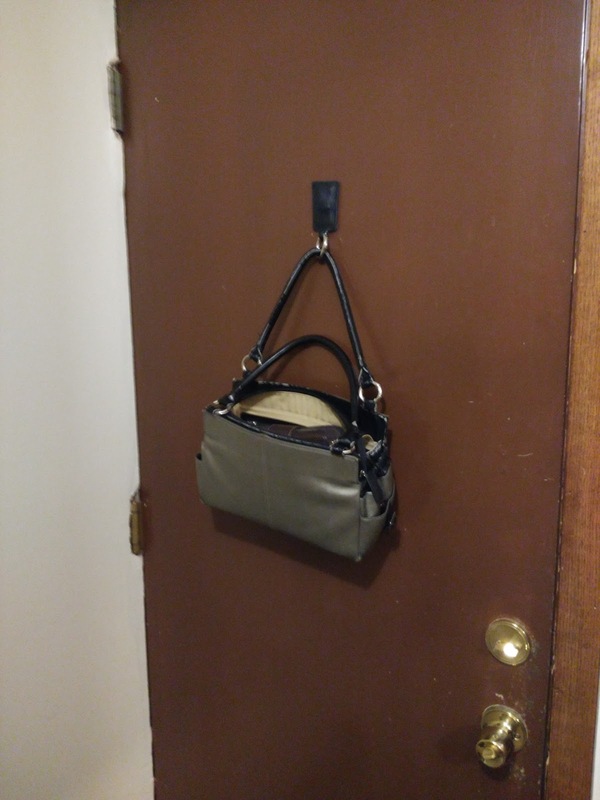 Bagnet™ keeps your hands free and your purse safe from theft so you can take care of business! To prevent it from unintentionally sticking to objects simply clip it on the inside of your bag. Don't worry, it won't harm your cell phone or credit cards. Bagnet™ comes in handy in dozens of situations and on countless objects. So far in just the couple weeks I have had it, I have used it many different ways - at the movie theater, in the bathroom, in my house - pretty much anywhere I can! My husband is SOO happy my purse doesn't lay around our house anymore taking up space. I just simple stick it to the back door so I don't forget it on my way out (mommy brain!) or stick it on our closet for easy access any time I need it. I am using the Jane Bagnet™, a black pebbled leather. Jane fits the bill with just about any look, whether it's date night or work day - Jane's got you covered. Her hardware is a polished nickel open/close O-ring. 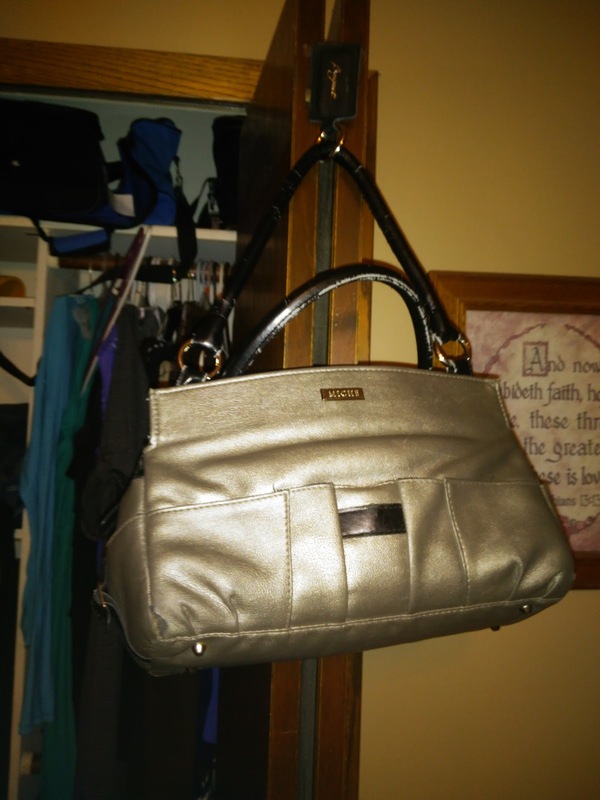 The Jane Bagnet holds a capacity of 9 lbs so even my heaviest purses can get hung! I just love finding ways wherever I go to use my Bagnet! Never again do I have to place my purse on nasty floors, lose it in my house somewhere or struggle with holding it when I don't want to! The Bagnet has seriously become a lifesaver many, many times! It amazes me that such a simple concept can not be something I can't live without! You can purchase Bagnets from their online store in many colors and weigh limits. Bagnet is generously offering (1) Bagnet to a lucky winner!